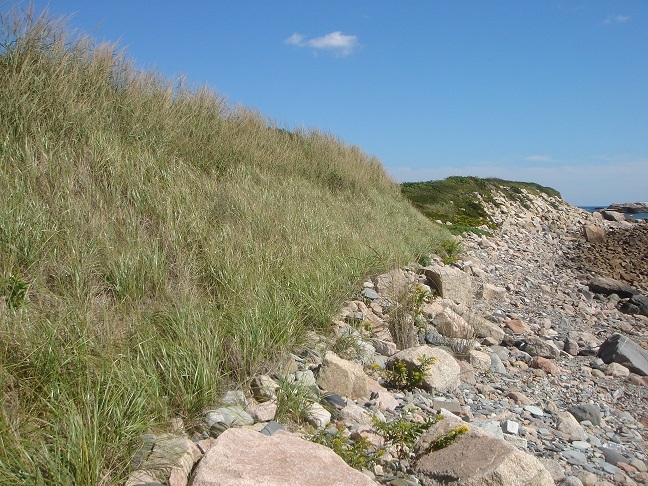 Enhance or restore capacity of coastal banks to protect upland areas from erosion and maintain habitat and ecosystem function for coastal species. Coastal bioengineering projects reduce erosion by using a combination of deep-rooted plants and erosion-control products that are made of natural, biodegradable materials. Common bioengineering techniques include the use of natural fiber blankets, coir rolls, and planting native vegetation buffers. Natural fiber blankets are mats made of materials such as straw, burlap, and coconut husk (also called coir). Some may be made of loosely woven coir twine, while others of straw, coconut or a mix of fibers held together with netting made from coir or other materials. Coir rolls are cylindrical rolls packed with fibers (i.e., coconut husk fibers), and are held together with netting. The rolls are typically 10- to 20-feet long and can be stitched together to provide continuous shoreline coverage. 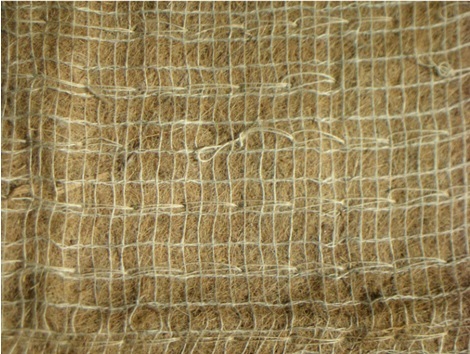 In contrast, coir envelopes are coir fabric filled with sand. Coir envelopes have very different impacts and design considerations and should not be confused with coir rolls. Coastal beaches, dunes and banks change constantly in response to wind, waves, tides, and other factors such as sea level rise and human changes to the shoreline system. Climate change will result in greater storm damages to existing coastal development and an increase in recurring storm damage to individual properties. A range of shoreline stabilization methods exist to address risk from storm damage, erosion, and flooding to coastal properties; however, some methods can unintentionally do more harm than good by worsening beach erosion, damaging neighboring properties, impacting marine habitats and species, and reducing the capacity of beaches, dunes, and banks to protect inland areas from storm damage and flooding. Bioengineering represents natural shoreline stabilization techniques that can effectively reduce erosion of exposed soil, sand, and other sediments from wind, waves, and overland runoff while providing storm damage protection to landward areas. When properly designed and installed, bioengineering techniques can have relatively minimal impacts to the shoreline system and coastal habitats compared to the use of hard structures (e.g., seawalls and revetments) and may increase the adaptive capacity and resiliency of surrounding areas to climate change impacts. 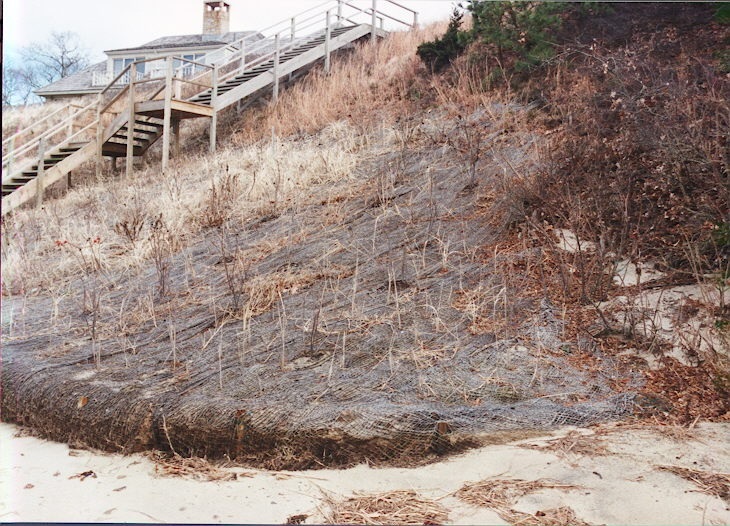 Please note: Under the Massachusetts Wetlands Protection Act, hard structures are only allowed on coastal banks when necessary to protect buildings permitted before August 10, 1978, and only if no other alternative is feasible. In many cases, bioengineering projects and other non-structural alternatives are therefore the only options available for reducing erosion and storm damage on coastal properties. A natural fiber blanket installed using anchor trenches and planted with live plants. To promote project success, the bank surface was seeded with a mix of salt-tolerant grasses and stakes were installed throughout the blanket to ensure close contact with the ground. Natural fiber blankets, coir rolls, and vegetation provide direct, physical protection to reduce erosion of bare soils and sediments. 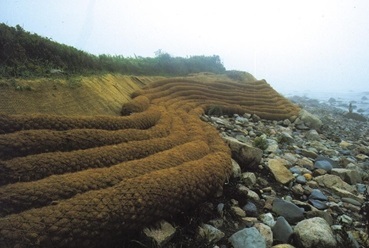 Because they are made from natural, biodegradable materials and are planted with vegetation, coir rolls and natural fiber blankets absorb much more wave energy than “hard” shoreline stabilization structures (e.g., seawalls and rock revetments), which reflect significantly more of the wave energy that hits them onto beaches or neighboring properties. Bioengineering projects allow some natural erosion from the site, while hard structures impede virtually all natural transfer of sediment to beaches. Without this sediment supply, down-current areas of the beach system are subject to increased erosion. Furthermore, because these bioengineering projects can be designed with products composed of natural fibers and planted with native vegetation, they can also help preserve the natural character and habitat value of the coastal environment. 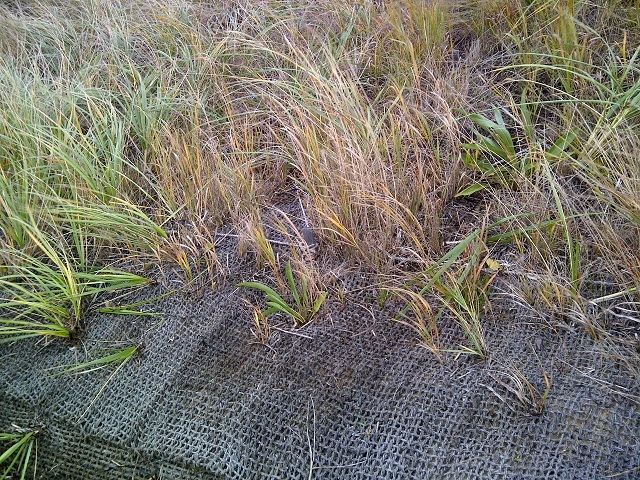 Natural fiber blankets are used on non-vegetated portions of banks to prevent erosion while native salt-tolerant vegetation with extensive root systems becomes established on the site. A salt-tolerant seed mix is spread across the area before the natural fiber blanket is secured, and then live vegetation is planted through the blanket. 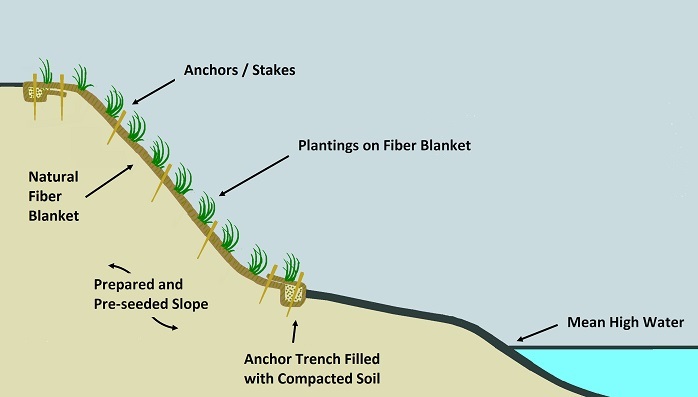 The blanket helps hold sand, soil, and other sediments in place by protecting the surface from erosion caused by wind, salt spray, and flowing water. The seeds grow quickly and also help hold the soils while the larger plants become established and begin to spread. The blanket also retains moisture to promote seed growth and protect the roots of the live plants. As the natural fibers in the blanket disintegrate over six to 24 months, depending largely on the density and type of fiber blanket selected, the dense root systems of the plants take over the job of stabilizing the site. Cross-section of a bioengineering project with coir rolls on a bank exposed to waves. Coir rolls provide stability and protection to the site while the vegetation planted in and above the rolls becomes established. If the toe of a bank is eroding, the upper bank may collapse even if it is well vegetated. 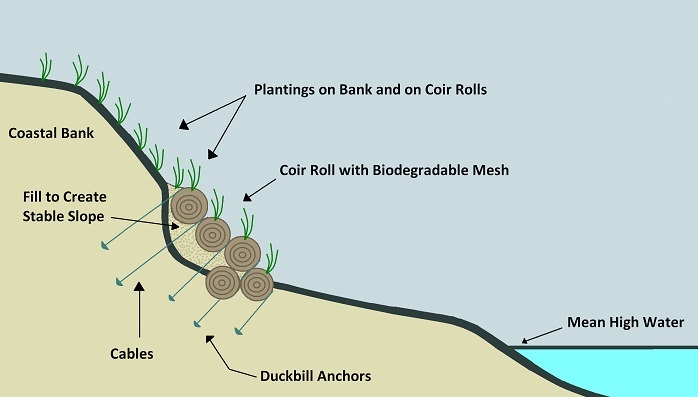 Coir rolls can be used to protect and stabilize the toe by providing a physical barrier that buffers waves, tides, and currents, reducing erosion of exposed sediments. As the coir rolls disintegrate, typically over five to seven years, the plants take over the job of site stabilization. 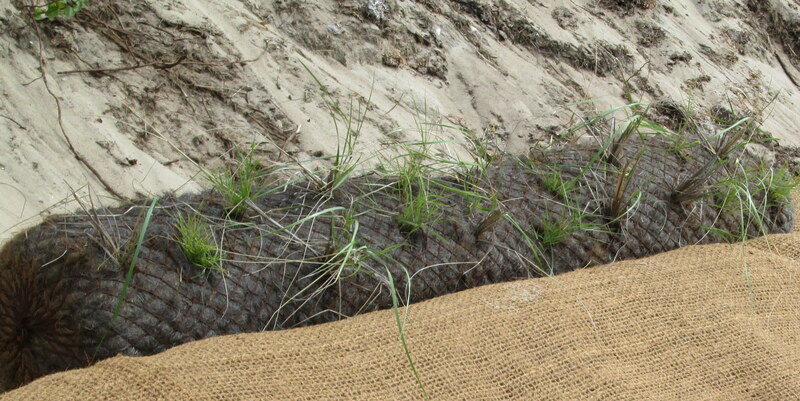 Natural fiber blankets and coir rolls are often used in conjunction with other techniques for erosion management, such as beach and dune nourishment. They can also be used to mitigate adverse effects such as end scour associated with hard coastal engineering structures (e.g., seawalls). 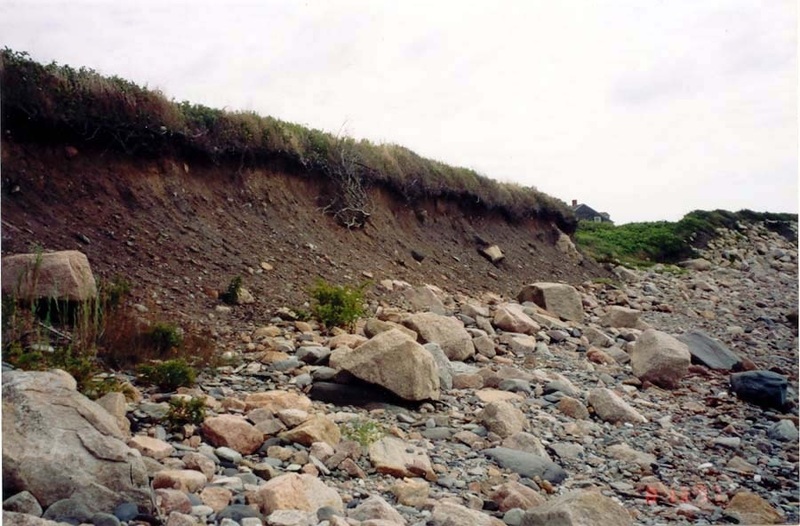 BEFORE: The photo shows an exposed bank in Massachusetts that was eroding at two feet per year before coir rolls and erosion-control vegetation were installed. Bioengineering for coastal banks is appropriate on almost any coastal bank to help stabilize soils and sediments while plants become established. 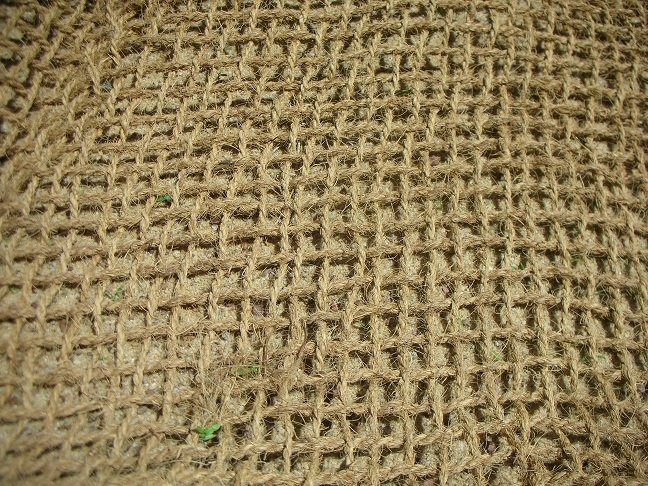 Natural fiber blankets are typically used on non-vegetated portions of banks. Coir rolls are typically installed at the toe (i.e., base) of the bank — although they can also be installed up the bank face. While these bioengineering techniques are appropriate in both sheltered sites and sites exposed to wave energy, they are most effective on sites with wide (dry) beaches at high tide. On banks, a stable slope is essential for project success. If the bottom of the bank has eroded and its slope is steeper than the upper portion of the bank, the bank is likely unstable. Even when heavily planted with erosion-control vegetation, banks with unstable slopes are extremely vulnerable to slumping or collapse that can endanger property landward of the bank. Before planting vegetation, therefore, the bank slope should be regraded. If the slope is not stabilized, bank collapse during a storm could cause substantially more loss of land area to the sea. In addition, any investment in vegetation and other methods to prevent erosion on an unstable bank will be lost if the bank collapses. Invasive plants should be carefully removed and replaced with appropriate native plants if they are preventing establishment of erosion-control vegetation on a bank; however, this process should be undertaken with caution to avoid destabilizing the bank. Native, salt-tolerant species are recommended for coastal use because they are well adapted to the harsh conditions, require less maintenance to grow and thrive, and provide more diverse food and shelter for wildlife. In addition, only plants with extensive root systems should be selected for erosion-control projects. Because of their persistence, successful control of invasive plants can take years to accomplish and may require perpetual monitoring and management. See the Massachusetts Office of Coastal Zone Management’s StormSmart Properties Fact Sheet 3 for more information on replacing invasive plants with native vegetation. Trees and large shrubs should not be planted on the face of a bank because their height and weight can destabilize the bank and make them vulnerable to toppling by erosion or high winds. Existing trees on banks can be pruned back to help address this problem. Because vegetation can alter habitat, care must be taken with vegetation projects in protected species habitat. Selecting appropriate types of vegetation (e.g., grass vs. shrubs) can reduce impacts to nesting habitat for protected shorebirds and turtles. If the project is proposed in or adjacent to habitat for protected wildlife species or horseshoe crab spawning areas, there may be limitations on the time of year that the project can be constructed. Information about the location of these resources and special permitting requirements can be obtained from the Natural Heritage and Endangered Species Program of the Massachusetts Division of Fisheries and Wildlife (for protected wildlife species) and the Massachusetts Division of Marine Fisheries (for horseshoe crabs). To further minimize environmental impacts, only blankets and coir rolls composed of natural fibers held together with mesh made from natural fibers are recommended for coastal stabilization projects.